THE SAN FRANCISCO BAY GUARDIAN - "The Tuvans will ride into your brain and leave hoofprints up and down your spine." JAZZ TIMES - "A rustic joyousness and unadulterated expressiveness come out of these musicians." THE CHICAGO TRIBUNE - "It is unfamiliar yet very accessible, an other-worldly but deeply spiritual music that is rooted in the sounds of nature." 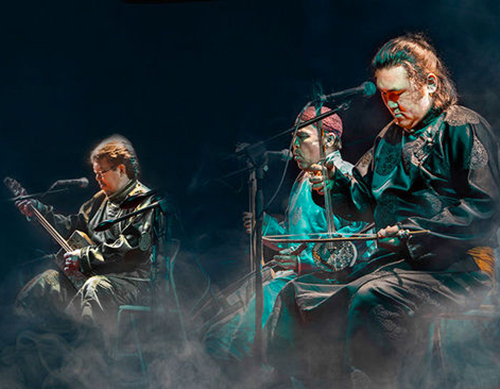 LOS ANGELES TIMES - "When a Tuvan sings praises of mother and country, which is what a Tuvan usually sings, he often does it in three-part harmony. By himself." 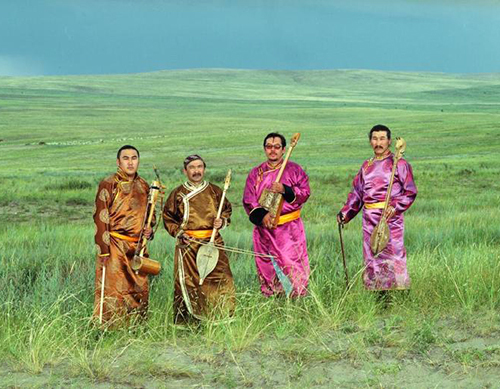 UNION NEWS - "Imagine cool, fresh air, high altitudes, the wild open spaces of the steppes, rushing rivers, singing birds, galloping horses, yurts, and a culture that combines Buddhism with shamanism, and then imagine that you hear the sounds of all these elements in the music. With a beat. That's what it sounds like." THE GAZETTE (Montreal - Feb.99) - "The sound is peculiar, haunting, hypnotic. It is a guttural, sometimes piercing sound of vocal chords burrowing into the flesh of mother nature. It is wind and rushing water and crumbling earth, it is called throat singing and masters of the technique are headed our way..."
THE OREGONIAN (Portland OR - Feb.19, 99) - "The members of Huun-Huur-Tu are perhaps the best known practitioners (of throat singing) and accompany themselves on all manner of strange and wonderful instruments... The resulting sound is as compelling as a wild gallop across the steppes." METRO TIMES (Detroit MI - Feb.3, 99) - "Throat-singing Cowpokes... Who are the real cowboys? 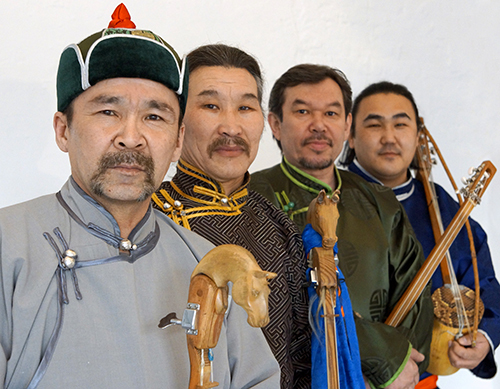 If you ask a typical Tuvan, they'd tell you that cowboys are from the Wild, Wild East. East? 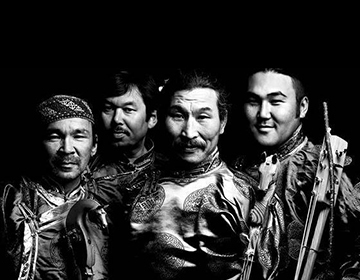 From the tiny central Asian republic of Tuva comes a quartet of the world's most renowned musical renegades... The group is also Tuva's unofficial cultural ambassador, sharing with the world the unusual musical traditions from their small patch of land nestled between Siberia and Mongolia..."
BACKBEAT (Denver westworld.com - Nov. 97) - "The juxtaposition of [Angelite]’s ecstatic, deeply felt wailing and the bottomless pitch of the Throat Singers..., produces so wonderful a sound that their pairing seems inevitable." DIRTY LINEN (Jan. 97) - "This music is both very spiritual and down to earth, grounded in a strong sense of place, yet its appeal is universal. The group bridges the gap between old and new like few others." TUCSON WEEKLY (Jan. 97) - "In the case of Huun-Huur-Tu...the art of imitation is rooted in a centuries-old world view of music as an offering, as opposed to the commercial vehicle catering to the least common denominator we've come to expect. The end result is a strange, beautiful tapestry of sound and rhythm that taps into something more real, more authentic, than anything you'll likely find on the American musical landscape." THE WASHINGTON POST (Jan. 96) - "...Between verse come sounds that seem unlikely for either voice or string. They are high and whistling, like bird calls. Sometimes they are croaking, down toward the nether reaches of detectable pitch. Sometimes they have a pulsing, rolling quality sustained for lung-aching duration, sounds that seem to capture the essence of ever-flowing water and ever-blowing wind." CMJ NEW MUSIC REPORT (Feb. 95) - "Huun-Huur-Tu presents the style in the context of wonderfully tuneful songs..., using instruments (igil, byzaanchi) reminiscent of banjo and fiddle. 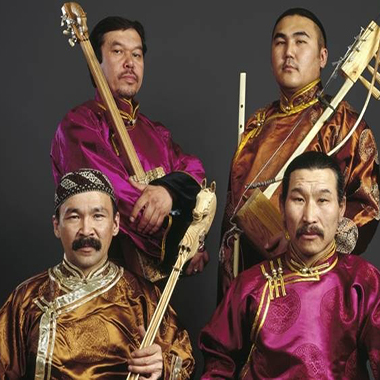 But the combination of low growling and highpitched harmonics, along with the less-than-commonplace khomuz and dazhaanning khavy make these songs particularly jawdropping."